Royal Blunts XXL Purple Haze Cigar Wraps 25/2's 50 blunts - Royal Blunts XXL OGK Kush - Royal Blunts XXL Naked - Royal Blunts XXL Pineapple - Royal Blunts XXL Fruit Punch - Royal Blunts XXL Wet Mango - Royal Blunts XXL Peach - Royal Blunts XXL Purple Haze - Royal Blunts XXL Black Mamba - Royal Blunts XXL Blueberry - Royal Blunts XXL Chronic - Royal Blunts XXL Chicken & Waffles - Royal Blunts XXL Blu Magic - Royal Blunts XXL Sour Apple - Royal Blunts XXL Fruit Punch. 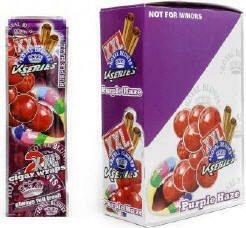 Royal Blunts XXL Purple Haze Cigar Wraps 25/2's 50 blunts 25 foil packs with 2 Blunts per pack 50 Blunt Rolls per box. Royal Blunts XXL Purple Haze Cigar Wraps 25/2's 50 blunts wraps come in reseal-able pouch and are infused with fresh flavors. They also come in unique flavors for when you want to experiment, such as Jamaica Rum, Black Mamba, and even Chicken and Waffles!